Deep Purple were originally signed in 1968 to Parlophone Records in the UK, before switching to EMI’s progressive imprint, Harvest, the following year. In 1971, the band’s management set up Purple Records, to release Deep Purple’s records from Machine Head onwards, but also the various side projects the band members were developing, and artists that they were discovering and respected. The label would eventually become home to debut solo releases from Jon Lord, David Coverdale and Glenn Hughes, as well as early releases from Michael Des Barres’ Silverhead and Ronnie James Dio’s Elf. Following expanded reissues from the resurrected Purple Records by Deep Purple’s Jon Lord, Glenn Hughes, Silverhead, Elf and Hard Stuff, Cherry Red are proud to announce the new 3 disc edition of The Butterfly Ball And The Grasshopper’s Feast. After leaving Purple in 1973, Roger Glover was asked to compose music to the illustrated book of the same name by William Plomer and Alan Aldridge. His first major project since leaving Purple, Roger was able to enlist many top names to help him realise his vision, including Glenn Hughes and David Coverdale, then both in Deep Purple as well as Elf’s Micky Lee Soule and Ronnie James Dio. Not included on the original vinyl LP, the single ‘Little Chalk Blue’ featuring future Uriah Heep singer John Lawton is also featured on CD 1. 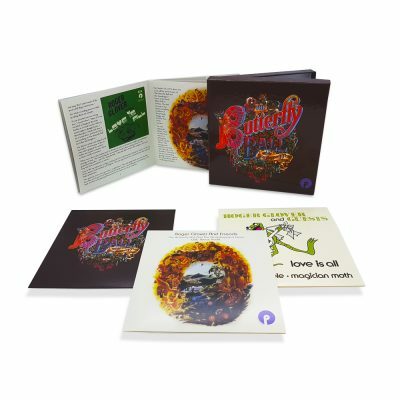 As well as the remastered album, a second disc features nine demos and alternative mixes, plus the very rare Butterfly Ball Radio Special, a 1974 promo only release where the album’s creator and producer, Roger Glover, discusses and explains the story behind the creation of the project. The third disc is a replica of the ‘Love Is All’ EP, a huge hit single across Europe on its 1974 release, featuring Ronnie James Dio on lead vocals. Presented in a clamshell box set with booklet, individual wallets and poster, with sleeve-notes from Malcolm Dome, who has written a new essay based on interviews with Roger, plus text reproduced from the original 1974 press release.